Whoooooo’s ready for fall? I am, now that I’ve finished decorating our front porch. 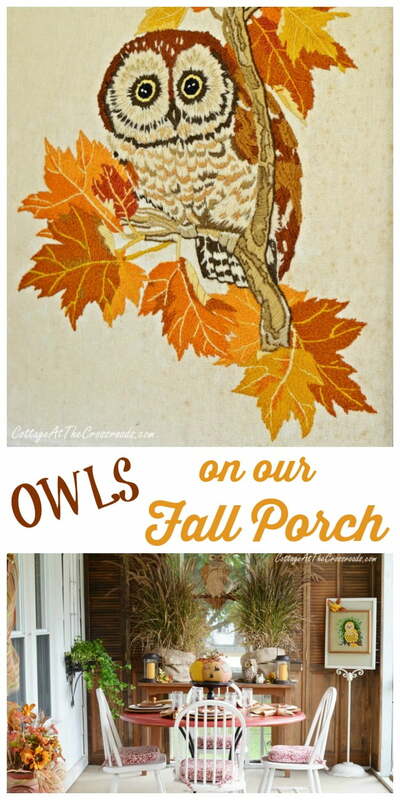 And even though everything is still green around here, I’ve filled the porch with all the glorious colors of autumn and a whole bunch of hoot owls! 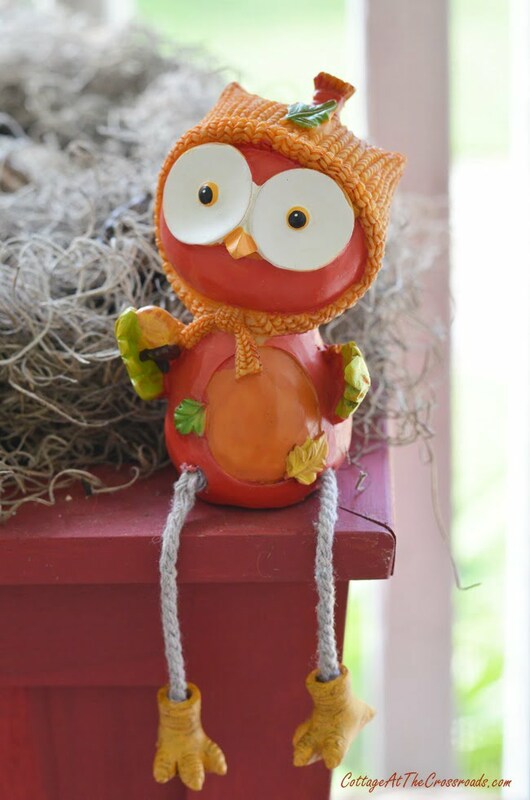 You may remember that about a month ago, we showed you this wooden owl that we created in the post Using a Dremel is a Hoot. 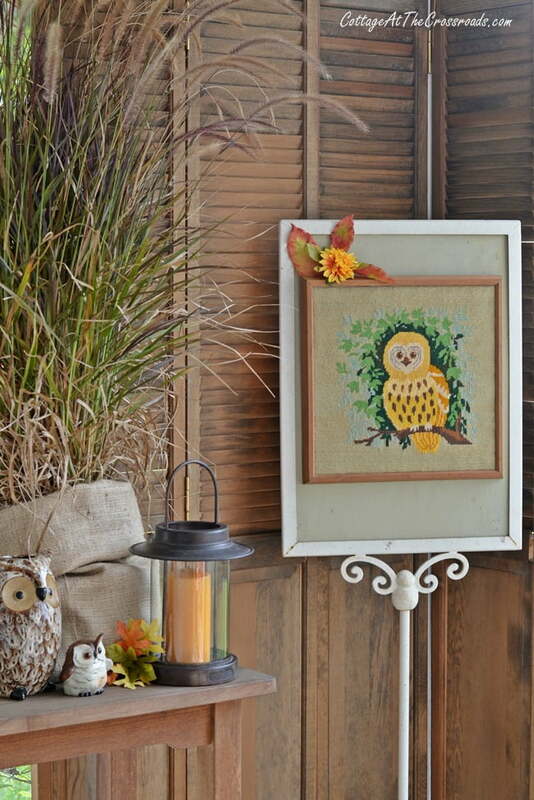 I knew then that I wanted to go with an owl theme for the porch, so I started collecting some owl items and came across some really cool vintage needlework at the auction. This cute, golden owl was one of my finds. And so was this piece of crewel. I got both of them for $5. 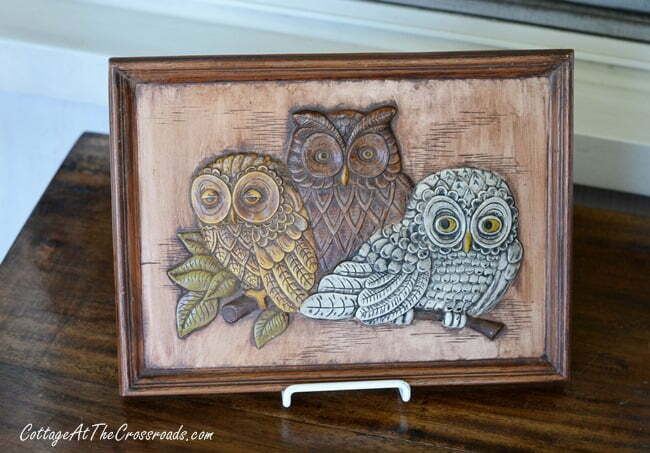 And on another day, I spotted this piece with the 3 owls. They look like they’ve been carved from wood, but it’s just plastic! 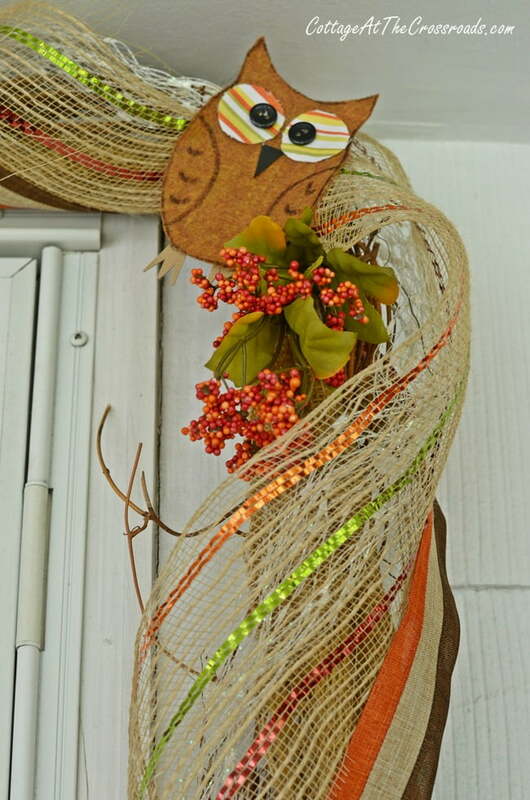 And my sweet sister-in-law Jean got into the hunt and found this owl on a trip to Atlanta, and I turned it into a wreath for the front door. Around the front door I have a grapevine garland that gets decorated for each season, and you can see some little owls that I made for it. I cut them from felt and added a few embellishments such as some eyes made from scrap material and buttons for eyes. This little guy is perched on top of one of the red lanterns that we added last Christmas. 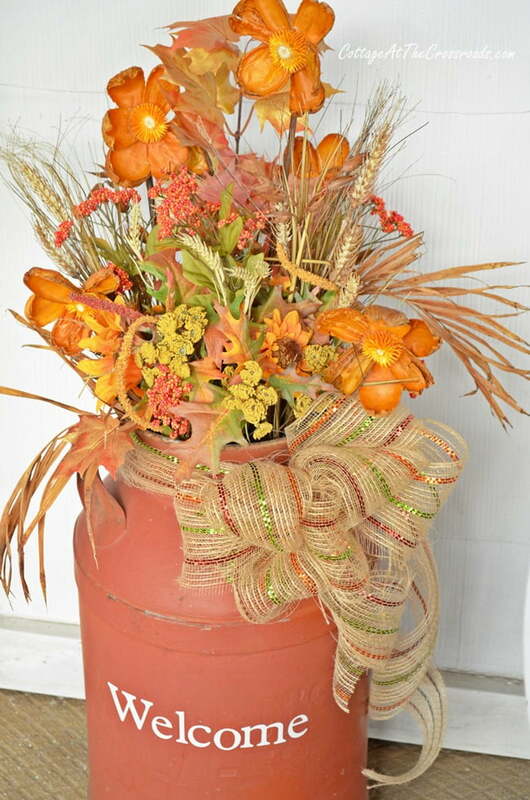 The old milk can that always sits beside the front door got a new fall treatment. 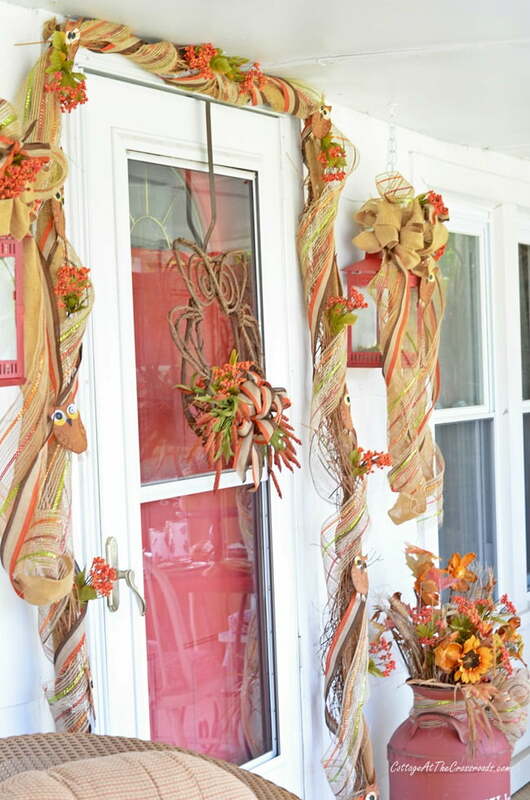 I was fortunate to find this mesh ribbon which has some red in it along with other fall colors because the porch has a lot of red items on it. The ribbon was wide so I cut it in half so that it would go further! The table is set with some owl salad plates that I wisely bought when I first spotted them at Walmart. 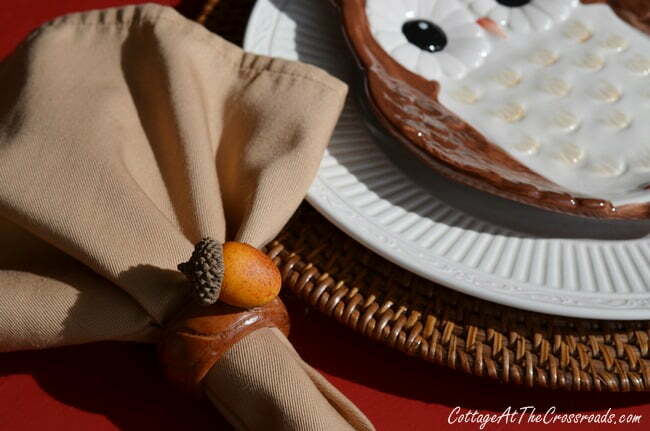 The old wooden napkin rings got hot-glued with an acorn. 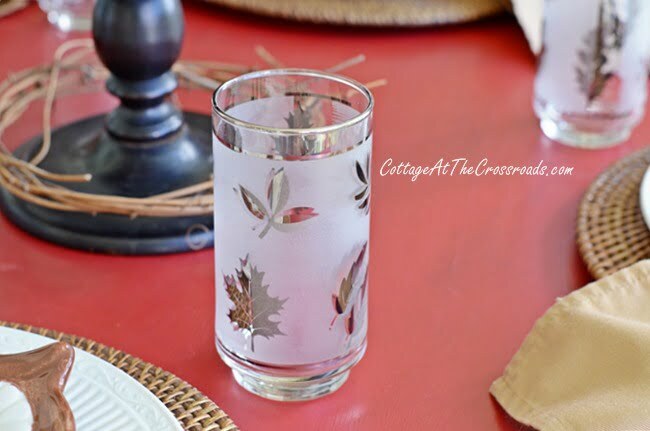 And I thought these vintage glasses that I bought at the auction went perfectly on my autumn table. 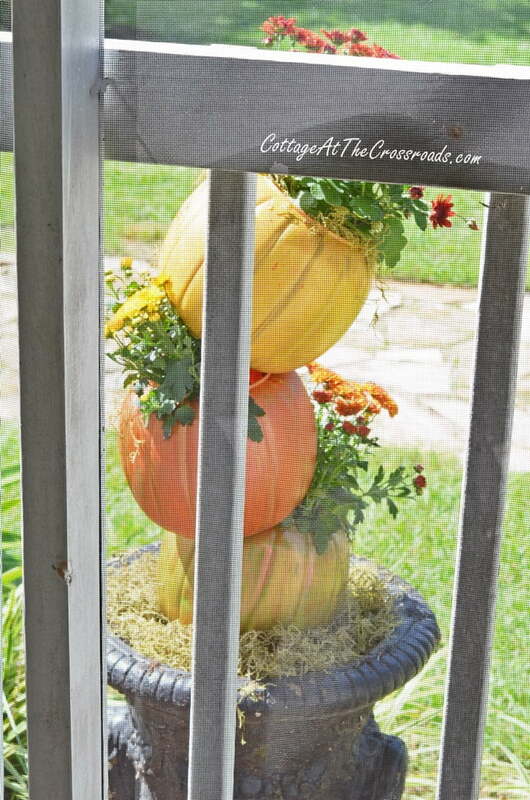 Now, you can’t have a fall porch without a pumpkin, can you? 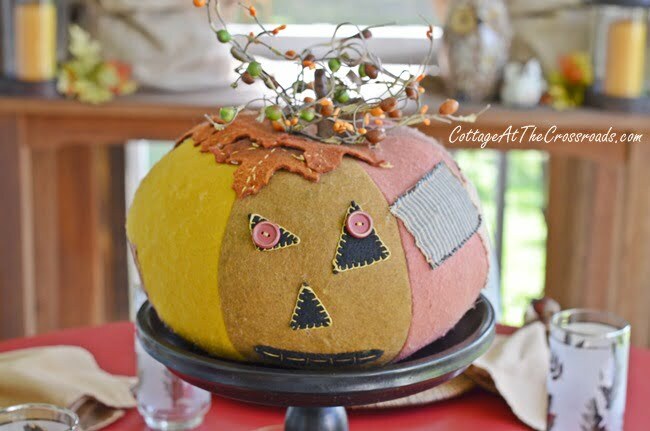 The centerpiece on the table is this vintage patchwork pumpkin that I found……….at the auction, of course! Oh my! Don’t you just love its shabbiness? 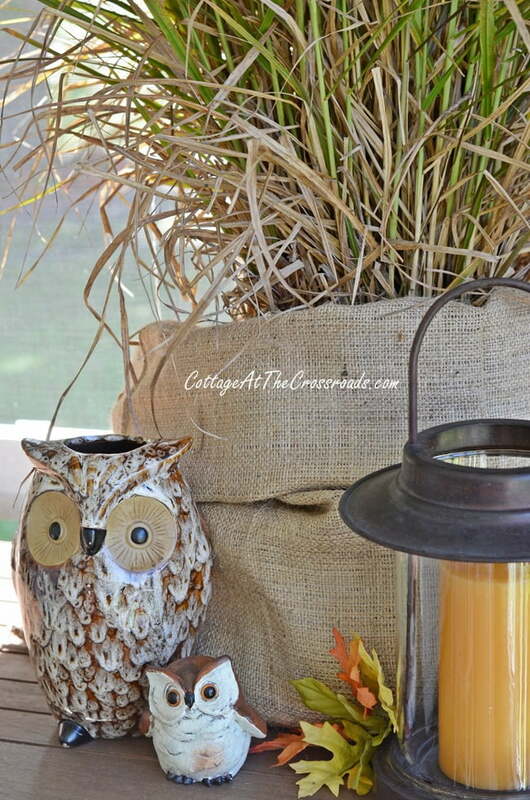 On the table that sits at one end of the porch, I put 2 purple fountain grass plants in burlap bags. They had out-grown their pots and my sister-in-law was going to dispose of them, but I grabbed them. I had just the place for them to go! 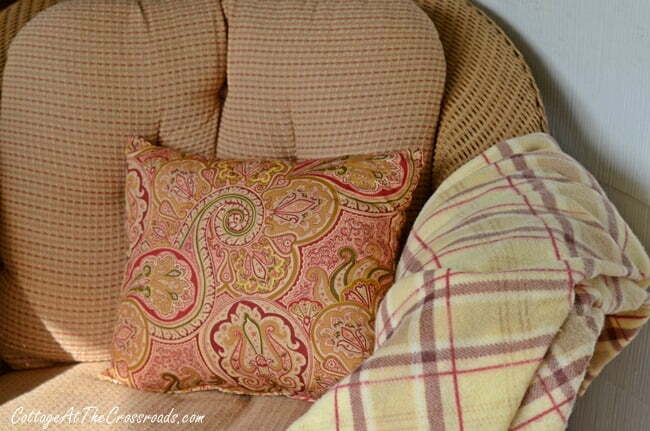 At the other end of the porch is our sitting area with some new pillows in the chairs. 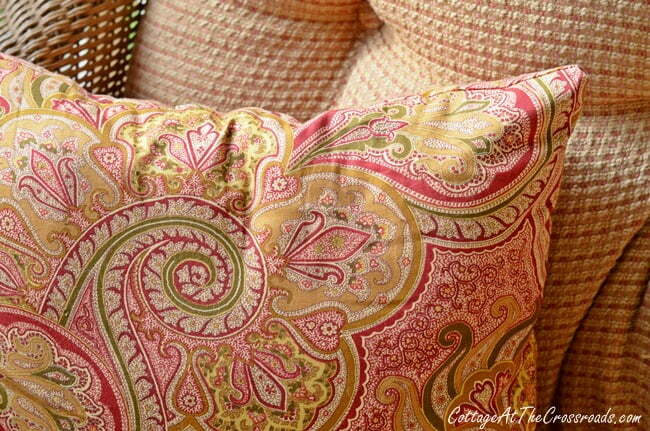 I was in the Carolina Pottery store in Columbia and spotted a bargain bin of pillows. I got two of these for $4.99 each. They are not outdoor pillows, but at that price, who cares? The colors in them are a perfect match to the upholstery fabric that been on the cushions longer than I even want to think about. Do you remember the cute red and white ticking shade that I made for the lamp on our summer porch? 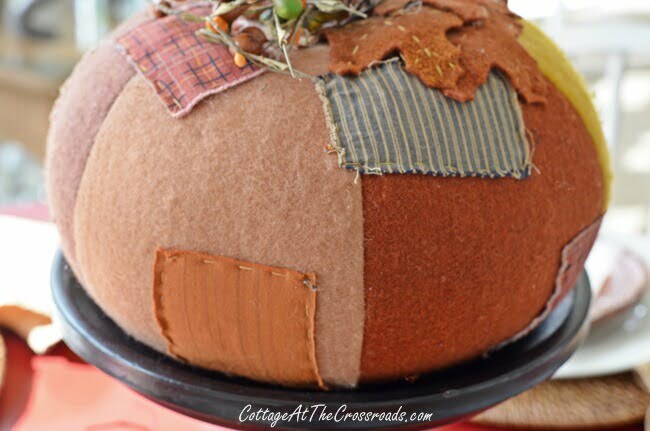 Well, I whipped up a burlap one for fall and I promise, I’ll return soon with a tutorial on how to make one! 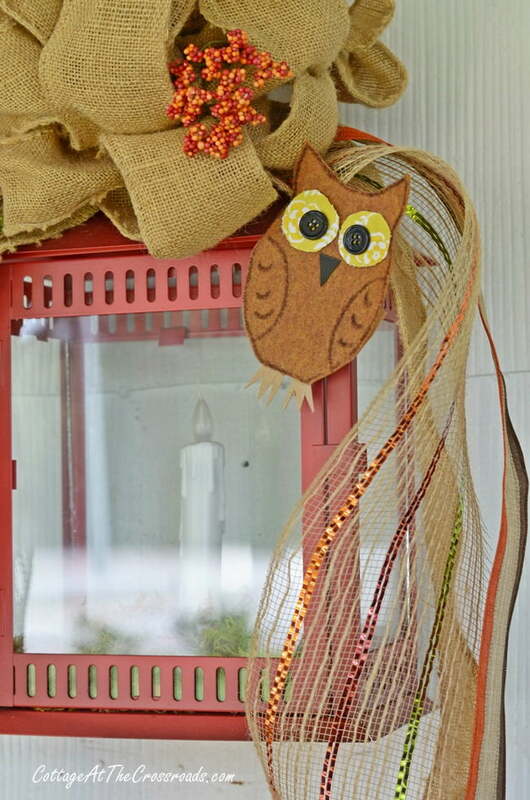 Another owl in the rocker is welcoming fall. So is this little cutie that came from Dollar General! I think I’ll name him “Hootie!” Anything as cute as that needs a name, don’t ya think? 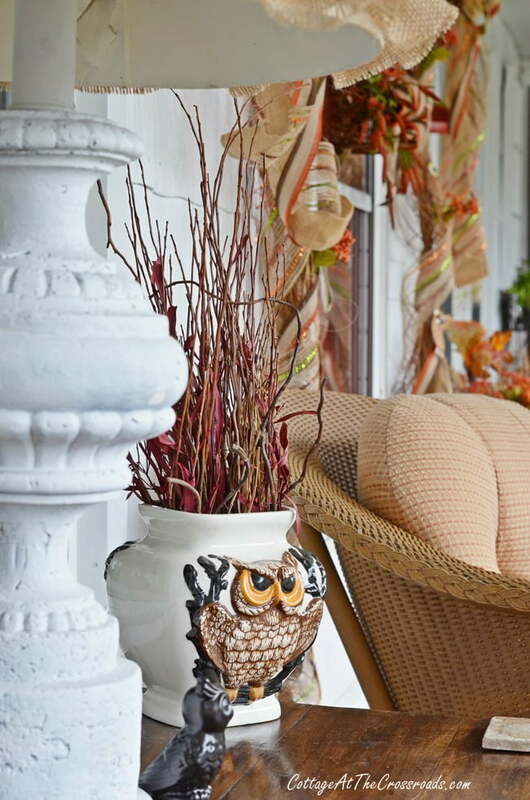 This vintage ceramic owl vase made its first appearance on our fall mantel several years ago. From inside the porch, I can enjoy our Topsy Turvy Jack-O’-Lanterns. 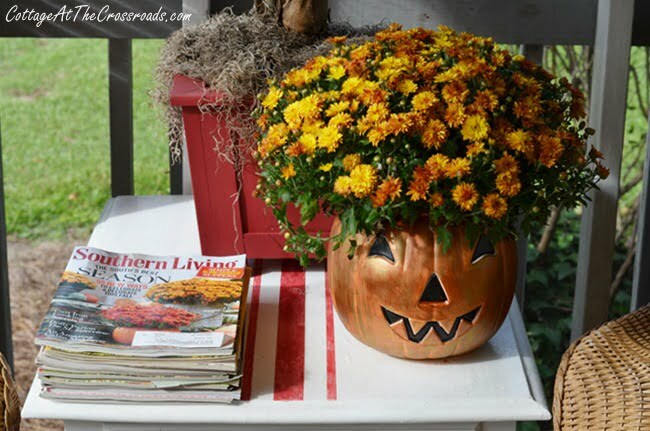 And another one of the cheap, plastic trick-or-treating pails that I turned into a planter has made it way onto the porch along with a stack of magazines. 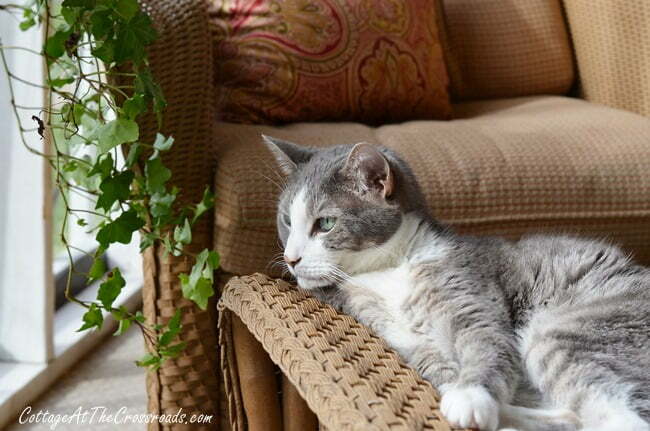 There is no better place for perusing magazines than a front porch! 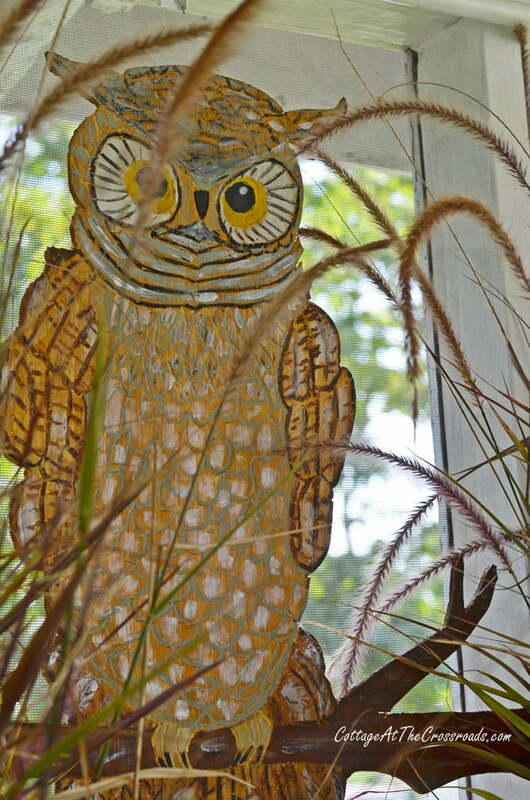 I know this post is about owls on our fall porch, but the dancing frogs are downright giddy with the cooler temperatures and the feathered friends. And Rascal? Well, he does what he does best and that’s napping on the porch! I hope you’ve enjoyed your little porch tour and if you’d be so kind as to pin a few pics on Pinterest, that would be wonderful!!! 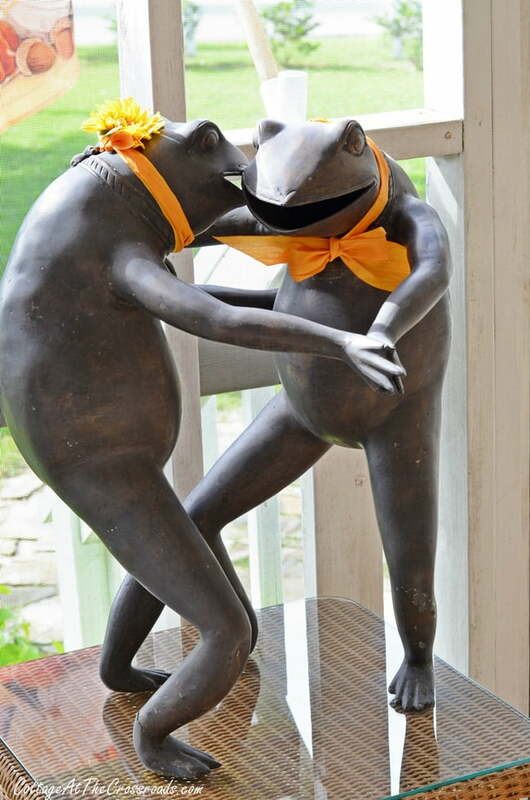 Can you please tell me where I can purchase the dancing frogs from in this post? I absolutely love them! Luv your blog. Awesome projects. I’m making a burlap scarecrow for my front porch. Thnx for sharing your ideas & creativity! Oh your owls are adorable, Jane! What fun! I love the garland around your front door. What a pretty welcome it makes! This is so GREAT Jane, love this owl motif. 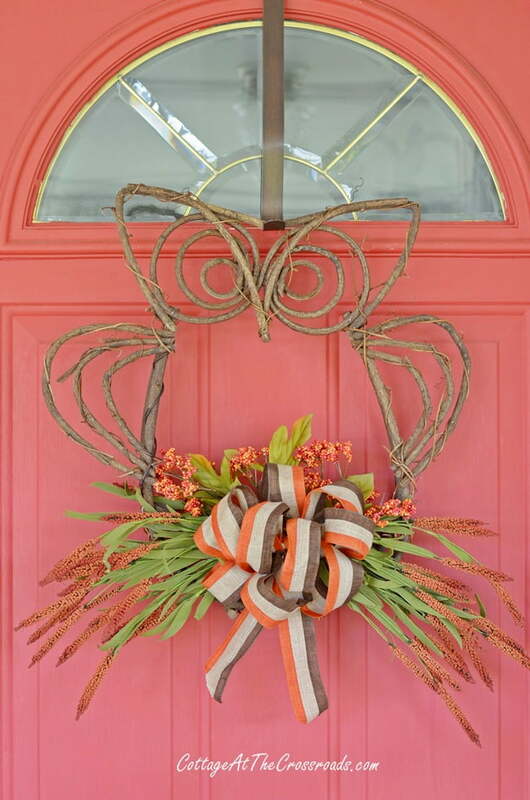 That wreath is amazing and the carved piece does look like wood, pretty amazing. You always do such a fantastic job. Look out for my posts. I am behind on decorating for fall. 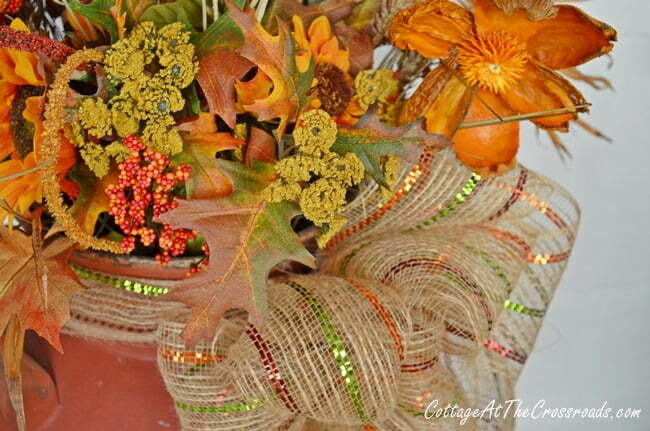 Getting decorated and trying to do fall at the same time is a challenge. Oooh girl, you have outdone yourself with the fall decorating! I love EVERYTHING you did, and I can’t say that about all the stuff out there on the blogs! 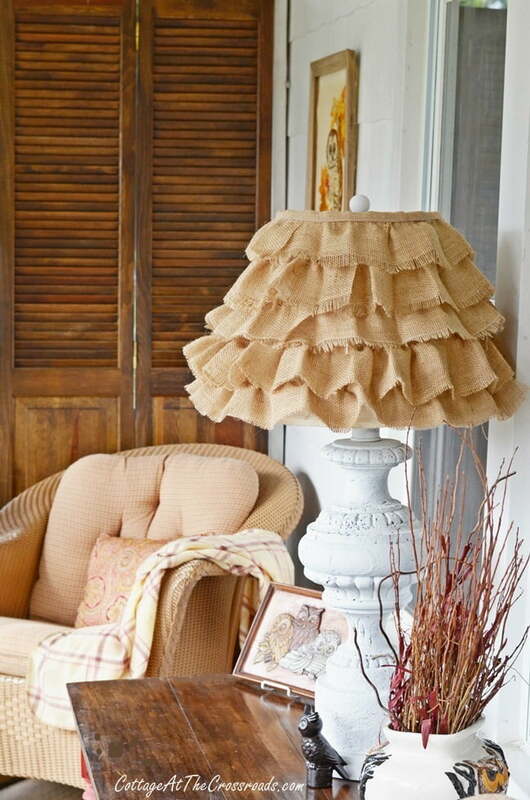 I am gonna copy your burlap shade, for sure. I didn’t want it to be too dark, but I have some cream colored burlap that I think will do just fine~~*squee! * can’t wait to get started…. Very nice job of decorating, I love the owls! I love your porch! I love owls, on the wing or in picture! I’m so glad you told us what kind of grass you used, because I wondered as soon as I saw the picture! 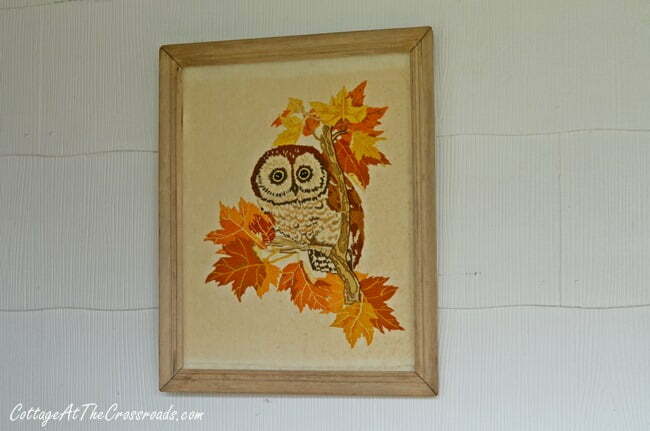 I love your front porch and the owls are perfect for fall! OMG your vintage glasses… Mum had those when I was a kid and teen. NO idea where they went to, but they are gone! WOW loving your owls will have to share with my daughter in law, she and one of her aunts love owls. I love everything that you have done! Every owl, every fall touch, the lamp is so very cute. That entire seating section is gorgeous…I love your owl that you made and that pumpkin with the button eyes is true folk art….I can remember probably the time you moved into that house because it has always been a pretty place but something special started when Leo and you moved back home! It all looks so pretty Jane! 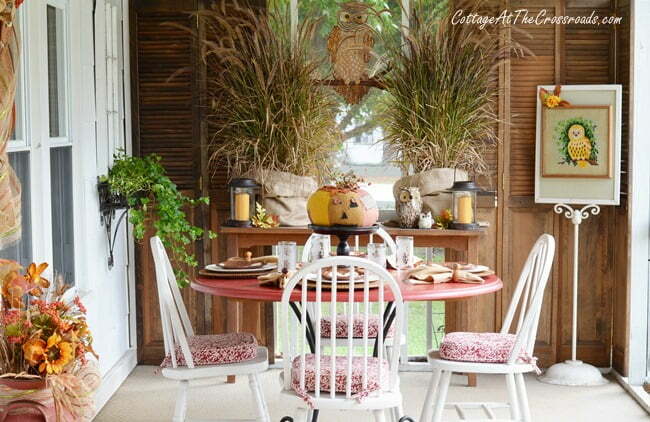 I absolutely LOVE that first shot…the way the shutters flank the window and those tall grasses on the table! 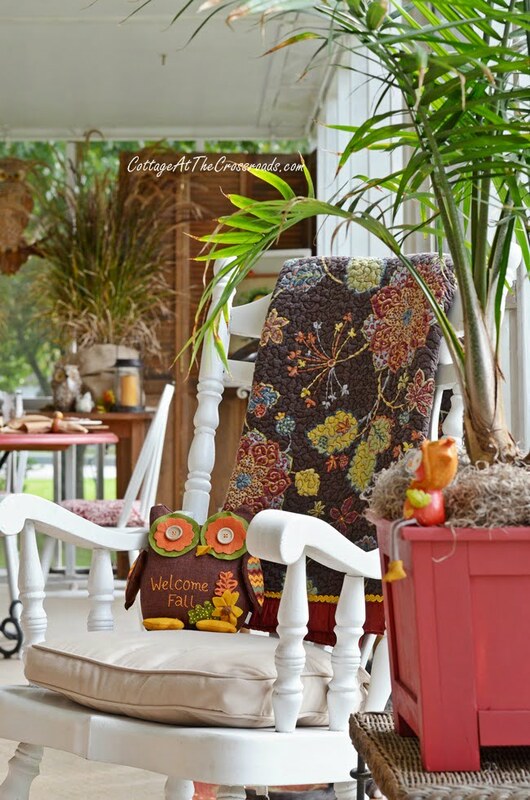 What a cute, cute theme for your porch – and you rescued old needlework, too!